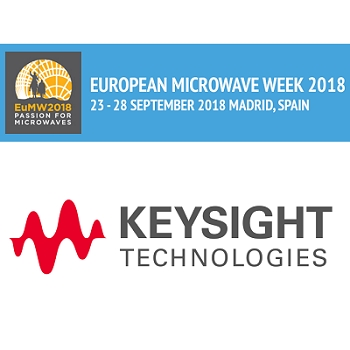 At the 2018 European Microwave Week (EuMW), which will take place in Madrid from 23-28 September, Keysight will demonstrate a wide range of high-frequency test equipment and solutions that help customers master microwave complexities as well as design, simulate, and test their latest innovations. Electronic Warfare Threat Simulation to analyze and measure pulse characteristics. Microsatellite Field Test to test radio frequency (RF) flight hardware such as satellite payloads and transceivers. Precise and reliable IoT measurements for easy, one-button measurements that quickly link cause and effect. Design for Quantum Computing to create, deploy and simulate custom hardware-accelerated Digital Signal Processing (DSP) into instruments. 5G Base Station and Field Test to streamline 5G design validation at 28GHz and 37-39GHz with new wideband signal source and analyzer families. Millimeter-Wave Testbed to generate and analyze very wide-bandwidth millimeter-wave test signals. Volume 5G manufacturing solutions for flexible, lean 5G new radio (NR) manufacturing test capabilities scalable from sub-6 GHz to the new 24-43.5 GHz mmWave bands. Complete Transceiver Characterization to address varying measurement results between test systems, or due to changes in test cables. Zero Compromise USB Test Stations to decrease costs and get products to market faster by leveraging the same technology across all instrument platforms used in each phase of product development. PathWave Asset Advisor for real-time test asset utilization and health data. PathWave Design to connect circuit design, EM analysis, and system simulation. PathWave Test to accelerate test workflow, with the power to collaborate and manage test projects from a web browser. Click here to see everything RF's event coverage of EuMW 2018.